Semtech Corporation (Nasdaq: SMTC), a leading supplier of analog and mixed-signal semiconductors, today announced that Advantech, a leading provider of embedded and automation products and solutions, has chosen to use Semtech LoRa™ technology to enable long-range RF connectivity with the new standardized M2.COM sensor platform. The M2.COM platform is a module that combines wireless technology, a microcontroller unit (MCU) and networking capability with a standardized interface for sensors. Integrated LoRa technology will allow for longer range, lower power communication and connectivity into the low power, wide area networks (LPWANs) being deployed by telecom companies and other network service providers internationally. Advantech, ARM, Bosch Sensortec and Sensirion, among others, launched M2.COM earlier this year to create an open and standardized sensor platform to simplify and accelerate Internet of Things (IoT) sensor applications for makers and sensor manufacturers. Target applications for M2.COM include outdoor wireless sensors, wireless measuring instruments such as CO2 meters and PH meters, agriculture moisture sensors, sensing/tracking devices for supply chain/logistics, and intelligent wireless controllers that allow remote management for things such as street lighting, traffic signals and waste management. 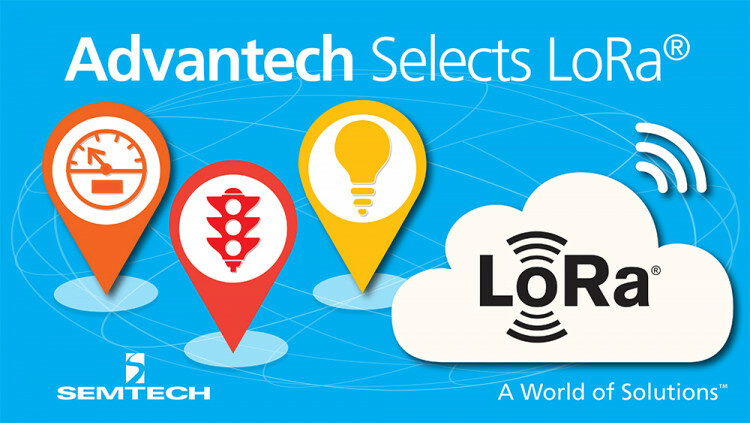 Get more information on LoRa® Wireless RF sensors and gateways. All statements contained herein that are not statements of historical fact, including statements that use the words “will,” “enable,” “allow” or other similar words or expressions, that describe Semtech Corporation’s or its management’s future plans, objectives or goals are “forward-looking statements” and are made pursuant to the Safe-Harbor provisions of the Private Securities Litigation Reform Act of 1995, as amended. Such forward-looking statements involve known and unknown risks, uncertainties and other factors that could cause the actual results of Semtech Corporation to be materially different from the historical results and/or from any future results or outcomes expressed or implied by such forward-looking statements. Such factors are further addressed in Semtech Corporation’s annual and quarterly reports, and in other documents or reports, filed with the Securities and Exchange Commission (www.sec.gov) including, without limitation, information under the captions “Management's Discussion and Analysis of Financial Condition and Results of Operations” and “Risk Factors”. Semtech Corporation assumes no obligation to update any forward-looking statements in order to reflect events or circumstances that may arise after the date of this release, except as required by law.